People ran in some very famous annual marathon races around the globe. On April 6, over 40,000 people took part in the Paris Marathon held in Paris, the capital of France. Kenenisa Bekele (from Ethiopia) won the men’s race with a time of 2 hours 5 minutes 4 seconds (2:05:04). Flomena Cheyech (from Kenya) won the women’s race with a time of 2:22:44. This marathon is known for the various musical shows along the race route. The world’s “coolest” marathon took place at the North Pole on April 9. Mike Wardian (from USA) won the men’s competition with a time of 4:07:40. Anne-Marie Flammersfeld (from Germany) won the women’s competition with a time of 4:52:45. With temperatures of -30 degrees Celsius (-22 degrees Fahrenheit), it was a very difficult race to run. Forty-eight participants from 16 nations flew to the North Pole for this race. There is no land at the North Pole. People run on a frozen ice sheet (about 6 to 12 feet thick) floating on top of water (the Arctic Ocean). Over 35,000 people took part in the London Marathon which was held in London, the capital of the United Kingdom on April 13. The men’s race winner was Wilson Kipsang (from Kenya) with a time of 2:04:27. 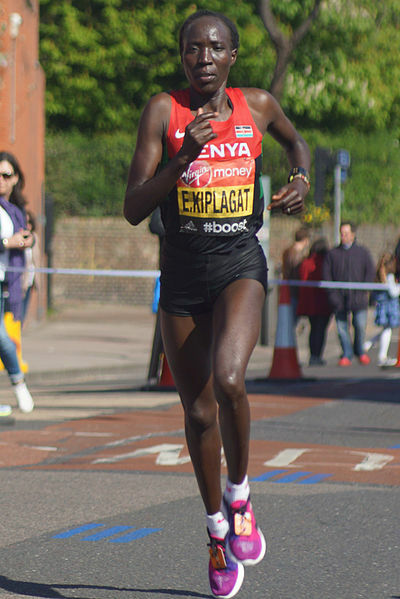 The women’s race winner was Edna Kiplagat (from Kenya, image) with a time of 2:20:21. The London Marathon raises a large sum of money for charities. The race is also known for people trying to set world records during the race. This year, 30 new Guinness World Records were set. Some of them were for the longest crochet chain whilst running a marathon, fastest marathon by a marching band, fastest marathon dressed as a toilet, and fastest marathon dressed as a telephone box. Another famous marathon is coming up. The Boston Marathon will be held in Boston, USA on April 21. The Boston Marathon is the world’s oldest annual city marathon and started over a hundred years ago in 1897. All four of these races have a running distance of 42.195 kilometers (26.2 miles). Why is this the distance? Well, the answer takes us back to the year 490 BC when there was a battle going on between the Greeks and the Persians in the Greek town of Marathon. The legend is that there was a messenger named Pheidippides who was sent from Marathon to Athens (now the capital of Greece) to announce that the Greeks had won the battle. Pheidippides ran the whole way, announced the message, fell over, and died. The distance he ran was about 40 km (25 m) long. The modern Olympic Games were first held in 1896 in Greece. 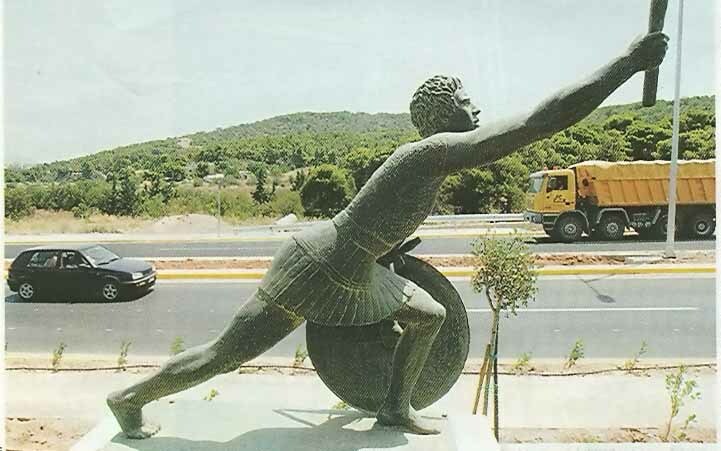 A racing event was added to honor the legend of Pheidippides and was given the name “marathon”. The distance of the marathon race was not fixed and the approximate distance of 40 km was used in the marathon races until 1921. This is when the organizers of the Olympics decided to use the marathon distance of the 1908 Olympics, which were held in London, UK. In those Olympics, the race had started at a castle called Windsor and finished in front of where the country’s royals sat in the Olympic stadium, an exact distance of 42.195 km. Here are two videos – the 2014 Paris Marathon and a funny video of a marathon race. One of the hardest running races in the world is the Marathon des Sables (MdS), also known as the Marathon of the Sands. It is held annually in the Sahara Desert in Morocco. It is a six day race that covers a distance of about 250 kilometers (150 miles). Temperatures can be as high as 50 degrees Celsius or 120 degrees Fahrenheit. The 2014 race recently took place.